Scientists are beginning to sample wells and water sources in the township. It will serve as proof if the water is poisoned by gas drilling. If Nockamixon’s groundwater is poisoned during natural gas extraction, officials will have the evidence. Scientists with Princeton Hydro, a New Jersey-based water and wetlands resource management company, are traveling throughout the township this week to sample wells, streams, creeks and aquifers. With a $25,000 grant, the Lower Delaware River Wild and Scenic Management Committee, a group of governmental representatives from Pennsylvania and New Jersey, voted in September to do the testing as a protective measure. Delayed all summer by frequent rainstorms, scientists have completed testing water wells at nine homes and the Upper Bucks Regional EMS headquarters. Now they’re roving the township, gathering 20 samples from creeks and streams. Overall, water data will stretch over a 300-square-mile region. If the water was to become contaminated, the Lower Delaware River management committee argues, this baseline, pre-drilling data could be used to make the case that drilling was the cause. “The baseline testing is extremely important. Because all the discussion we’ve had about accountability and liability, the onus is on us to show the integrity and clarity of our water and have documentation on it,” said the committee’s Pennsylvania chairwoman Nancy Janyszeski, who also serves as Nockamixon’s supervisor chairwoman. Scientists are focusing their water testing on both sides of the former Cabot Industries property, she said. The Cabot property on Beaver Run Road, just of Route 611 near Revere, is the only site in the gas drilling permit application stages at the state Department of Environmental Protection. The 102-acre property was home to a specialty metals production operation. The site underwent a federal environmental cleanup in the early 1990s. The U.S. Environmental Protection Agency has given the Cabot site a clean bill of health. The Lower Delaware River management committee is worried that one misstep at a drilling site in Nockamixon could spell disaster for its neighbors. Township homeowners rely on private water wells and septic systems, and many are already grappling with a diminishing groundwater supply. Natural gas is extracted thousands of feet below the surface via hydraulic fracturing, or fracking. The process uses vast amounts of water, mixed with sand and other chemicals, injected into the ground under high pressure to create fractures in the rock and allow the oil or gas to be more easily withdrawn. Like already-affected municipalities across the country, Nockamixon officials want the gas company to disclose what chemicals are being used, but it’s considered a trade secret and is exempted by federal law. About 250 homeowners have signed leases with Michigan-based gas drilling company Arbor Resources. Nockamixon supervisors have asked Bucks County Court to overturn a decision by the township’s zoning hearing board, which decided Feb. 9 that township ordinances go too far in restricting drilling and agreed with Arbor officials that the state’s Oil and Gas Act trumps local regulations. If groundwater is poisoned in the drilling process, the burden of proof will be with the gas company, said Shallenberger. “The state rules put the burden of proof on the drilling company. If there is a problem or if someone else reports a water quality issue within six months that the drilling occurs, there is a presumption the drilling company is responsible for a change in water quality,” he said. 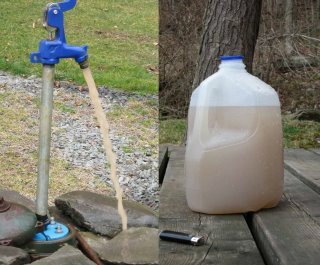 Although these samplings would serve as a before-and-after picture of Nockamixon water quality, it would bring little relief for homeowners suffering the consequences. “Water is crucial resource for everyone,” he said. Princeton Hydro’s water samples will be sent to the laboratory. Results are expected in a month. Does it account for Mr. Noel Van Swol calling pro-water advocates “dilettantes” at the July 15th DRBC Hearing? Your statement provides no substantiation that I’ve exaggerated my claims so there’s little I can say in response. Despite your assessment of my position (“I see one thing over and over again on this blog — a true lack of an open mind. You’ve made up your mind about gas drilling, despite much evidence ((especially in western NYS and other areas inside and certainly outside the West) that it can live in harmony with the environment and local communities.”)) I am not opposed to drilling and hydraulic fracturing; I am opposed to slipshod processes. To further explain my objection to shoddy process, I opposed invading Iraq without well-articulated reasons, proof and adherence to Constitutional law. I was especially opposed to our policy makers relying on Ahmad Chalabi’s vested-interest “clarifications” since he was angling to be Saddam’s replacement. More personally, having been a teenager myself, when my kids told me the party they were attending was safe, I automatically checked with the chaperones. Loving our children or liking corporations doesn’t absolve us of using common sense. If people behaved rationally and with the “common weal” firmly in mind, we’d have no need of laws or oversight or even newspapers and discussion fora. “In interviews with ProPublica and at a public meeting this month in Pavillion’s community hall, officials spoke cautiously about their preliminary findings. They were careful to say they’re investigating a broad array of sources for the contamination, including agricultural activity. They said the contaminant causing the most concern – a compound called 2-butoxyethanol, known as 2-BE – can be found in some common household cleaners, not just in fracturing fluids. “But those same EPA officials also said they had found no pesticides – a signature of agricultural contamination – and no indication that any industry or activity besides drilling could be to blame. Other than farming, there is no industry in the immediate area. “…according to EPA investigation documents, most of the water wells were flushed three times before they were tested in order to rid them of anything that wasn’t flowing through the aquifer itself. We don’t have to argue the content; readers can decide whether or not I am attempting to “whip [them] into a frenzy” or whether I’m reasonably concerned by the consequences we see in Wyoming, Fort Worth, Dimock (PA) and elsewhere of “rushing to judgment” as we did in Iraq. Isn’t it rational to wonder why those with the least are risking the most and well-heeled energy corporations are poised to make out like bandits yet again? Is it particularly onerous that I would raise those issues when our very water supply depends on drilling companies caring more for the water and our welfare than they do their profits? Is that me falling prey to “Earthworks’ propaganda” or is it a reasonable caution given the times in which we live and the fundamental nature of corporations which is to increase profits for their shareholders? I’m sure that your reasoning will provide comfort to the residents of Chernobyl and Three Mile Island which were, I’m sure you’ll agree, ground breaking events in their own right. As to your insistence that information printed by ProPublica is propaganda, please consider Mr. Lustgarten’s credentials (“Abrahm Lustgarten is a former staff writer and contributor for Fortune, and has written for Salon, Esquire, the Washington Post and the New York Times since receiving his master’s in journalism from Columbia University in 2003. He is the author of the book China’s Great Train: Beijing’s Drive West and the Campaign to Remake Tibet, a project that was funded in part by a grant from the John D. and Catherine T. MacArthur Foundation.”) and the fact that he has chosen to work for ProPublica as a respected news source. Then, please, provide evidence of your assertion that ProPublica spews propaganda as well as examples of gas industry propaganda. So you see, I completely agree, whether or not it’s my ” blog to do with as [I] please,” readers should demand that we provide well-researched and balanced information for them to chew over in a civil venue. In return, I ask the same of you and whomever you choose to write your rebuttal which I will be pleased to publish here.